TORONTO -- Jake Gardiner hasn't watched the tape of the Toronto Maple Leafs' devastating Game 7 playoff loss to the Boston Bruins last year. He hasn't had to because that bitter memory of the Bruins' series-clinching 7-4 win remains fresh in Gardiner's mind. On Thursday night, Gardiner and the Leafs will have a chance at redemption when they open their first-round playoff rematch in Boston. "You obviously never forget it but you kind of just put it to the side and it drives you to work harder and be better," Gardiner said Tuesday. "I don't think too much about it, to be honest, just try to move on. "But we need to take advantage of our opportunities and make sure we're prepared for each game." Toronto rallied from a 3-1 series deficit last year to force a seventh and deciding contest. In that game, Toronto led 4-3 in the third period before succumbing to the Bruins. Despite coming off a regular season where he registered a career-best 52 points (five goals, 47 assists), Gardiner was front and centre for many Leafs fans following the playoff loss. Not only did he post a dismal minus-5 rating in that game, Gardiner was on the ice for Boston's final three goals. 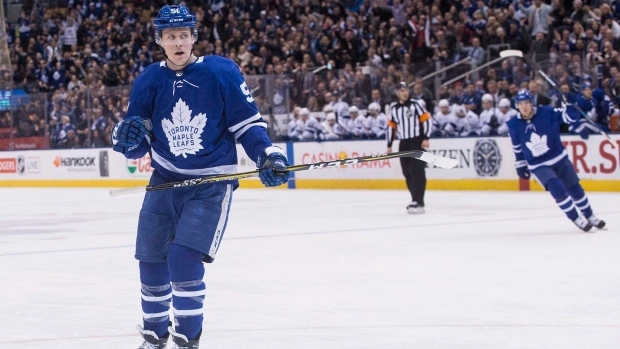 However, Toronto head coach Mike Babcock said his confidence in Gardiner has never waned. "I think he's someone that people have decided isn't a good player and so they pick on him," he said. "I'll tell you right now we can't find another one. "The way I look at it is really simple for me: I think he's a good player and I'm going to play him a lot." Babcock said there was plenty of blame to go around for Toronto's playoff exit last year. "This is what (Gardiner) did: He came out to the media and said he had a tough Game 7," Babcock said. "So then they ran with that for a while. "We all lost. We all were there." While the six-foot-two, 203-pound native of Minnetonka, Minn., said last year's playoff defeat is behind him, he admitted it took some time for that to happen. "It was, for sure, a couple of weeks," he said. "It was tough. "But I've got a good support system, my family is very supportive. Any time you have a defeat like that, it drives you to be even better each year." Gardiner had three goals and 27 assists in 62 games this season. He missed 18 contests with a back injury. but did play in Toronto's final two regular-season games. The series with Boston in an important one for Gardiner. The eight-year veteran is in the final year of his contact and that uncertainty does create a sense of urgency heading into the post-season. "Definitely," he said. "I've been with this team a long time, a lot of these guys. "I definitely have to take advantage of it." Gardiner said parenthood is giving him much-needed perspective. In September, Gardiner and his wife, Lucy, became parents with the birth of Henry John. "He's always got a smile on his face," Gardiner said. "I was telling my wife he's starting to like me a little bit more, he's smiling. "He's been a blessing, he's been awesome." Gardiner and his teammates are scheduled to practise Wednesday before departing for Boston. "The bottom line is the series is going to start in two days and the team that's most ready to play is going to have success," Babcock said. "We really believe we're going to be prepared, we've got a lot of people back. "We feel we'll be rested and ready to go so we're excited about the opportunity and look forward to going to Boston." Gardiner said the Leafs are more than prepared to face a hostile crowd in Beantown this year. The Bruins won 5-1 and 7-3 against the Leafs in the first two games last year in Boston. "All the young guys know what it's like going into that building now," he said. "It's always a really good atmosphere in there and pretty loud, especially the first couple of games."